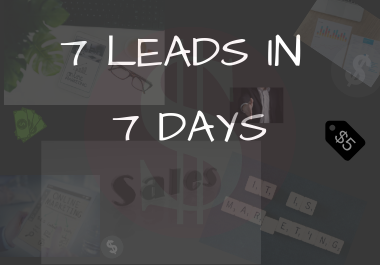 Let me handle getting you leads for a week and watch the leads come flying in! Any business! and anywhere or anything you can think of! I love marketing and will literally have a smile the whole time I'm working for you because I love what I do! I'm ready to take on any challenge!! I will forward you the daily leads at around 5 PM my time.. "Seattle"
*they will be real leads that are interested in whatever you have me advertise for you!